1. “Man on a Drinking Horse,” by Thomas Butts. Platemark 5.1 × 8.7 cm. A Print by Thomas Butts, Jr.
A posthumous restrike from a plate evidently etched by Blake’s pupil Thomas Butts, Jr. (or perhaps Sr.), in 1806 was offered on eBay in September, 2002, and I bought it for $4.99; this quickly led to another impression, now Essick collection, and then two more, as well as the location of the copper plate from which they were all taken.1↤ 1. Thanks to Robert N. Essick and G. E. Bentley, Jr., for additional research and helpful suggestions. All four impressions were made ca. 1942 by a Midwest-based print subscription collective (roughly on the model of the Book-of-the-Month Club) called the Miniature Print Society. The mat on which my impression of the print is mounted indicates that 250 were printed for the society’s subscribers, and an information sheet by Paul Gardner that accompanied it reports that the copper plate came from “the collection of Colonel W. R. Moss,” presumably an error for Lt. Col. W. E. Moss, the English collector. In 1937 Moss sold at auction seven copper plates executed by Butts; these had been found in an apothecary’s cabinet that Moss bought from the Butts family, to whom it was given by Blake as a gift (Bentley 176). The Moss sale of 1937 included “Six original copper plates by Thomas Butts under Blake’s tuition, framed and glazed,” as well as another Butts plate with a fragment of a Blake relief etching on the other side.2↤ 2. Moss 41; Essick reports in correspondence that according to an annotated copy of the sale catalogue the six plates in Lot 278 were sold “to ‘Last,’—no doubt a dealer,” who probably sold this plate to the Miniature Print Society. Lot 171 was a rejected plate from Blake’s America, now in the Rosenwald Collection, National Gallery of Art, that has a work by Butts on the reverse, making a total of at least seven Butts copper plates from the Moss collection in this sale. Essick and I both think it likely that the plate for “Man on a Drinking Horse” was among these six, though it could conceivably have been sold separately on another occasion. On 14 March 1942, the Miniature Print Society gave the copper plate to the Nelson-Atkins Museum of Art in Kansas City, Missouri; it is still there, but in temporary storage, so it was not examined for this note.3↤ 3. George McKenna, Consultant, Department of Prints and Photographs, Nelson-Atkins Museum, provided information about the plate and its acquisition. The senior Thomas Butts (1757-1845), a government clerk of modest means, was Blake’s most consistent and loyal patron. In 1805, perhaps as a Christmas present, the elder Butts hired Blake to give etching/engraving lessons to his son, Thomas Butts, Jr. (1788-1862), then seventeen. Known prints attributed to Thomas Butts include images of a seated, wreathed classical figure with a lyre; a head of a bearded saint; a bust of a winged angel; a satyr and dancing figures; two copies after Blake designs (“Lear and Cordelia,” “Christ Trampling Satan”); and two undistinguished commercial-looking begin page 36 | ↑ back to top plates that depict “afflicted” children, also putatively after Blake. Reproductions of the first two can be found in Briggs; all are discussed and the latter four are reproduced in Essick4↤ 4. The picture of “Venus Anadyomene” reproduced in Briggs (96) may be a drawing rather than a print; see Essick 212. (211-26). The new Butts print, called “Man on a Drinking Horse” by the Miniature Print Society, shows a mounted traveler wearing a wide-brimmed hat and leaning slightly forward (illus. 1). His horse is standing in shallow water, probably a river or stream, with its head lowered to drink. In the foreground are reeds, logs, stumps and other vegetation, and in the sky are some horizontal lines suggesting open sky and clouds. There is a bedroll behind the man’s lightly indicated saddle, and he is holding a long narrow object in his left hand (a crop? a staff?) that is pointed down in the general direction of the horse’s head. Both my impression and Essick’s are printed on laid paper with quite a bit of “plate tone,” imparting a grayish tinge to the whole printed area. Although the print is signed in the plate “T Butts: sc” and dated “22 Jan y. 1806,” it does not appear to be finished—a mysterious block of parallel hatching lines floats next to a tall stump at center right, and in general the clumsy execution is consistent with the date, which is only a few weeks after a year of lessons probably began sometime around Christmas Day 1805 (Essick 211). As in the case of all the Butts prints, it is not certain whether the Thomas Butts who signed the plate was the father or son; the elder Butts was said to have benefited more from the lessons than the son did (Essick 211). 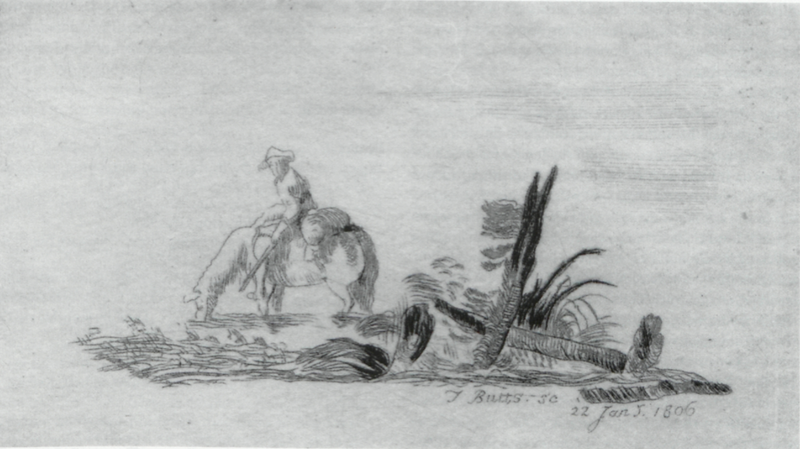 The signature on “Man on a Drinking Horse” closely resembles those on two other Butts works reproduced in Briggs, 94 and 96. There are no stylistic or other indications that Butts was working from a design by Blake, as he did in some of his other known works. But the composition as a whole is more sophisticated than the execution of the print, which suggests that it may have been copied from something, perhaps a vignette in a book. This is the only subject among known Butts prints that could be called a genre picture, and I doubt that it would have been Blake’s choice as an early assignment for a pupil. My impression of the plate is reproduced here; Essick’s is described in his annual report of Blake-related transactions for 2002 (Blake 36 :127). As this article was being completed, Sarah Jones, the managing editor of Blake, discovered that William C. Schneider, a collector in Troy, New York, had written to the journal in 1996 about another impression of this etching that he had purchased in Schuylerville, New York; he recognized its relevance to Blake studies, and still has the print, but for some reason nothing came of his inquiry. One more impression was offered on eBay in March 2003, and was purchased by G. E. Bentley, Jr. Somewhere out there are 246 more impressions of this undistinguished print, as well as at least five more copper plates capable of printing restrikes of other Buttsiana. Bentley, G. E., Jr. Blake Records. Oxford: Clarendon P, 1969. Briggs, Ada E. “Mr. Butts, the Friend and Patron of Blake.” The Connoisseur 19 (Sept./Oct. 1907): 92-96. Essick, Robert N. The Separate Plates of William Blake: A Catalogue. Princeton: Princeton UP, 1983. Copyright © 2019 Blake/An Illustrated Quarterly, all rights reserved. Items in this digital edition may be shared in accordance with the Fair Use provisions of U.S. copyright law. Redistribution or republication on other terms, in any medium, requires express written consent from the editors and advance notification of the publisher. Permission to reproduce the graphic images in this digital edition rests with the owning institutions.